The Guthrie hospital cross, that went missing and later found at a scrapyard in July, was raised and planted in its new home at Mercy Hospital Logan County Wednesday morning. 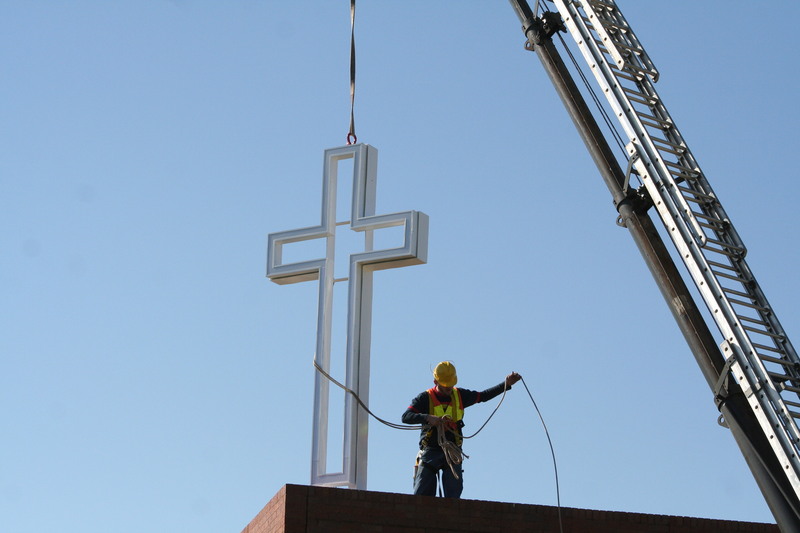 Workers placed the 5,200-pound steel cross near the on the northeast corner of the hospital, located at 200 S. Academy. The cross was restored to its original state with a fresh coat of paint and LED lights were also attached for night viewing. The eye-catching piece almost did not happen. On July 6, the cross was removed from the “old hospital” Logan County Memorial Hospital, located on 19th and Warner, and was sent to an unnamed south Oklahoma City sign shop. Managers later learned the eight-foot cross was stolen. The cross was later found at a Oklahoma City scrapyard and was given back to its rightful owners just days later. The cross was a gift to Mercy from the Sam Coury family, owners of the Logan County Memorial Hospital building. Josh Tucker, administrator of Mercy Hospital Logan County, said a blessing will be held in a few weeks for the cross and the renovated chapel inside the hospital. 3 Responses to "Popular cross lifted and placed at Guthrie hospital"
There is no magical power in that cross or the old hospital building. There is nothing to brag about. I was born there and almost died as an infant at the hands of an employee. Also bad things happen to me as a teen in that place when it was a shelter for troubled teens. It makes me sick to even see this cross or that building still standing anywhere.